If you haven't noticed yet, my friends and I have already jumped onto the healthy eating bandwagon. And after trying out a few healthy food destinations, we decided to amp it up and finally get a taste of real vegetarian dishes at Pipino, Vegetarian Food by Pino. Located at Malingap Street in the restaurant-filled Teachers Village, Quezon City, Pipino is actually a vegan restaurant taking pride of bridging healthy and delicious to both vegetarians and curious foodies like ourselves. Co-owned by Ms. Alessandra Lanot and the Pino group, this dainty and refreshing dining spot conveniently sits on the 2nd floor of Pino Resto Bar. Although the interiors at Pipino don't shout fancy, the combination of whites, limes, bricks and bleached wood gives off a really clean and sophisticated ambiance which also spells cozy, especially over a lovely natural lighting. And if the place wasn't homey enough, there are also hand-written menu boards by the other wall. It's not a secret that there aren't many vegetarian and vegan restaurants in the Metro. Although healthy eating is steadily becoming a new trend in dining, exclusive veggie-eaters are still left with only a few choices when eating out. But with Pipino's promise of offering creative dishes and not just your ordinary salad, even if I'm not a vegetarian, I know we'll be off to a good start. I know one would expect salads in a vegetarian resto. 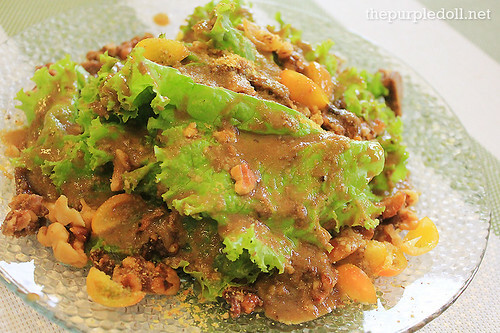 But trust me, this Wicked Walnut Salad (P165) is beyond delicious! Its combination of mixed greens, candied walnuts, cherry tomatoes, walnut parmesan cheese and Dalandan balsamic is not only a harmonious blend of sweet & tangy, and soggy & crunchy, but also very witty. You see, the whole dish is completely vegan (doesn't contain any animal product). Yes, even the cheese did not come from cows but was made from walnuts. 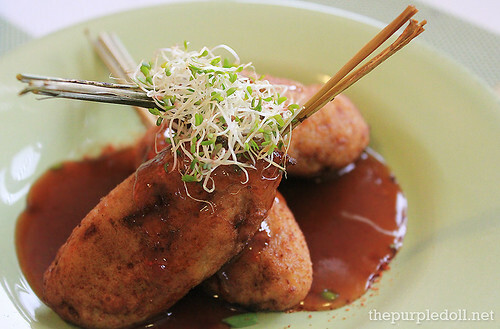 We also had a serving of the Tofu Lemongrass Skewers (P145), rolls of soft and succulent ground tofu served with chili-garlic sauce and topped with alfalfa sprouts. Although the rolls tasted strongly of tofu, the meatiness of the filling was totally unexpected. Even if I'm not a big tofu fan, I really enjoyed munching this meal starter for its pork-like texture. I may not know a lot of vegan dishes, but I'm well-acquainted with the Veggie Tempura (P80) since I eat a lot of it in Japanese restaurants. Coated with crunchy tempura batter and served with soy-mirin sauce, these slices of sweet potatoes, eggplant and carrots can replace my french fries and potato chips anytime! After a hearty start, it was time to try the entrées. 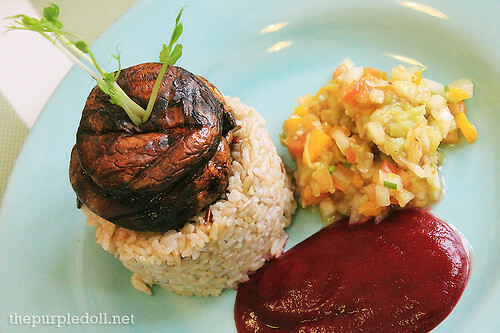 We first had a plate of Portobello Inasal (P260) -- a beautifully grilled stack of Portobello mushrooms served with red beet purée, ensaladang talong and brown rice. The grilled mushrooms were savory and salty, but the purée and ensalada gave it a nice balanced flavor which goes perfectly with the cup of healthy rice. 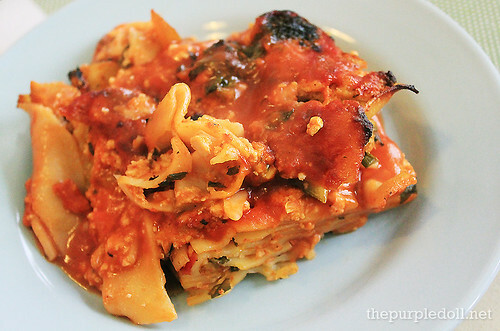 For pasta, we had the Low-Fat and Cheese-Less Vegan Lasagna (P120) with zucchini, eggplant and silken tofu ricotta. Although unbelievable, this lasagna dish tasted just like a regular meaty and cheesy baked layered pasta without actual cream and cheese. We also got to sample a fairly new dish on Pipino's menu, the Watermelon Steak (P220) -- beautifully charred slice of watermelon served with taro-miso mash, string beans, pickled mushrooms, alfalfa and taro chips. I know, Pipino must be crazy to make a steak out of a fruit. But surprisingly, they were able to pull it off! The watermelon steak oozes with tons of savory and succulent flavors, while the sidings were nice complements. 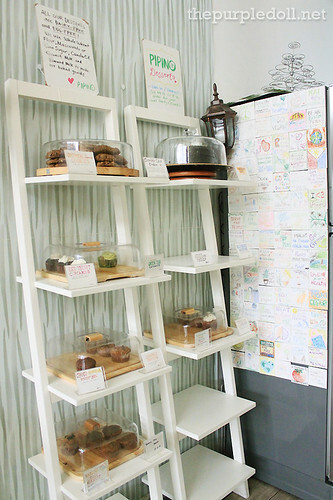 For sweet endings, we sampled Pipino's famous dairy-free and egg-free pastries. 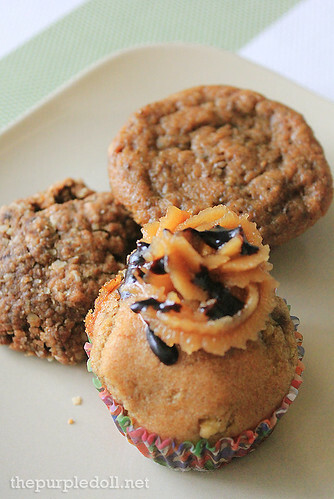 We had the Vegan Oatmeal Choco Chip Cookie, Choco-Banana Muffin (P25) and Banana Choco Peanut Cupcake (P50), all of which use coco sugar and are as good as their non-vegan counterparts. 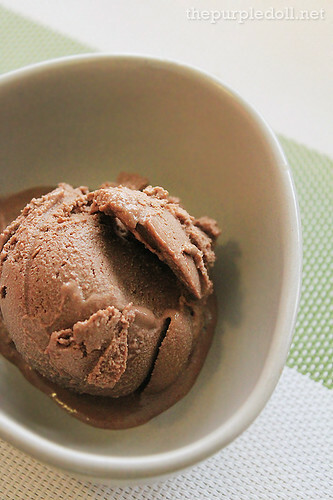 We also got to try the dairy-free Dark Chocolate Ice Cream (P40) made with local tablea and cashew milk. Although a little runny and grainy than regular ice cream, this cold cup of sweet treat is as satisfying. 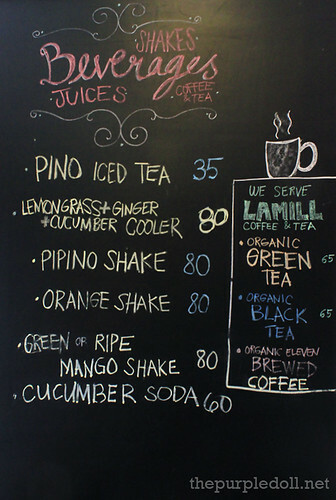 Since Pipino has an interesting line of unique drinks, it's a sin to miss trying out some. So for our trip, we had the Lemongrass-Ginger-Cucumber Cooler (P80), Pino Iced Tea (P35) and Pipino Shake (P80), all of which are super refreshing as they are visually appealing. At Pipino, all of my senses were tickled with their aromatic, visually enticing and flavorful food with a mix of interesting textures. And although I can never grow out of my roots, being an all-out carnivore, I grew a deeper appreciation for vegetarianism and veganism. I have to admit that I initially thought of vegan dishes as dull veggie-filled plates. But after this trip to Pipino, I can easily down a full course vegan meal and even crave for more. I am curious with the wicked walnut salad, it looks fun and delicious to eat with all of those assortment of ingredients. hey, that Watermelon Steak intrigues me. How does it tastes? They all look appetizing at it's a plus na healthy food lahat! Refreshing ang mga drinks nila ah! i love the place, it looks so clean and fresh. yum im a semi vegetarian! Whenever I read your posts, naglalaway talaga ako. All of the foods looked so yummy at ang ganda ng shots mo. This is right across Don-day so I always see it. hahahah The dishes are really creative! Healthy food often tends to be unimaginative but I'm surprised to see some really interesting combinations here like the portobello mushroom inasal and the watermelon steak. :D Galing! Pipino has lots of exciting dishes and they all turned out great didn't they? I'm sure we can come back there anytime and still find ourselves more amazing and interesting selections that are beyond our imagination. =D I really admire their perseverance and creativity. 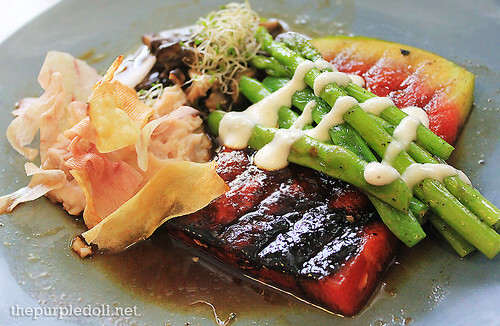 i love tofu dishes, though not a vegetarian...i'm curious on the watermelon steak, is that a main dish or a dessert? Ohhhh candied walnuts! Never knew they'd actually work as a salad ingredient at all. Hehe! Been there but still haven't blogged about it yet..love most of their vegetarian dishes and love to repeat it again. It is always a good idea to learn how to love eating vegetables. There's a restaurant in Banaue, QC that serves only vegetables and yet tastes like meat. By the way, I made a good food criteria list. Let me know if you agree or if you'd like to add some more. Thanks! I love the name "Pipino". Hope to visit the place soon. Glad you joined the bandwagon to healthy eating! My friend had her birthday thing here last year. Sayang I wasn't able to go. it was a cooking pa naman so cute sana :) Anyway, we'll probably try this when we're in the area. Enjoy the weekend! indeed a beautiful place to dine and unwind. I give this a 5 :) the food looks so yummy too. Now that watermelon steak is something new and different, very cool. I should give this a try! My girlfriends and I will surely visit them soon. 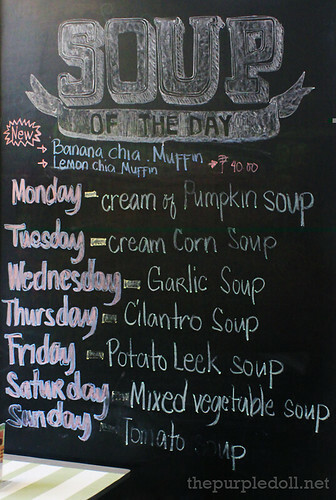 I have few vegan friends and I'm sure to mention this cool resto to them. I agree that vegetarian food is not just healthy but also yummy. Some Filipinos don't want to try vegetarian food because their mindset is that vegetables are bland. a friend invited me there for her birthday party but wasn't able to make it. i was with the owner and the friend at the orly trip in pico de loro and i am excited to try it out. those look delish! I am into veggie meal now. Thanks Sumi for sharing. Hope they will have more branches in the metro. tas the food... like na like!! sana may branch din sa sila sa south.. 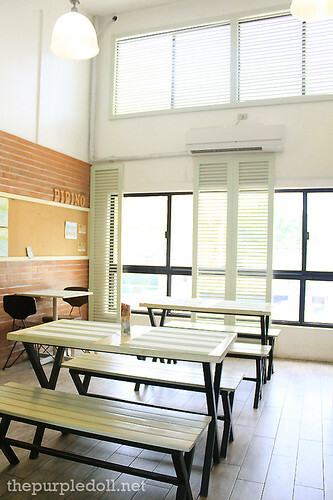 The food looks so delicious, the place is just too far for me, though I've heard rave reviews of Pipino as well! Hala! Parang gusto kong mag-vegan sa mga food na yan! 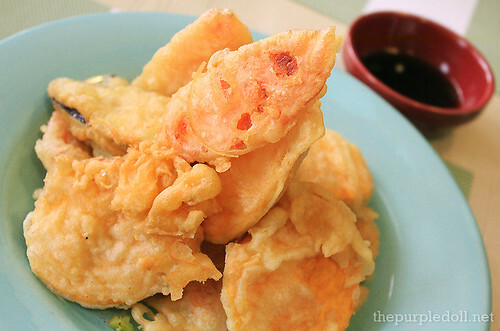 Wanna try the vegetable tempura. Charap! Yum! Yum. Love the place. Thanks for sharing. I hope I can get to try this place! I'd love to try their desserts and the soup! Wow. I love their shakes! Looks like heaven and the watermelon steak looks very delicious. Hmm.. Vegan food that doesn't look like Vegan. I like the presentation. I think even the kids would love it too. Love their shake. Wanna try the Lemongrass shake I go there.